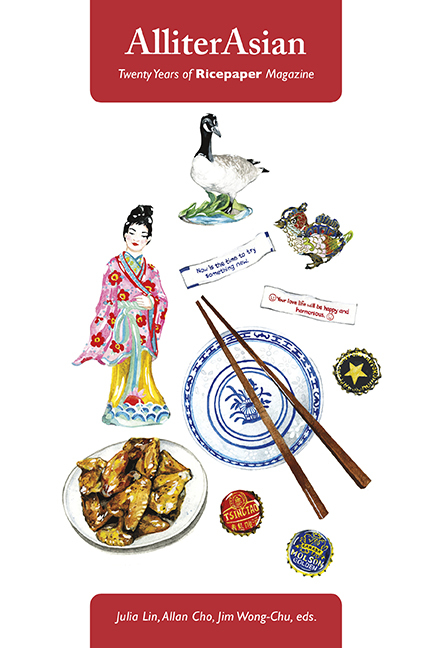 Published by Arsenal Press, AlliterAsian is a wide-ranging anthology of Asian Canadian literature to celebrate 20 years of Ricepaper. This celebratory anthology features exclusive interviews first published in Ricepaperwith David Suzuki, Tobias Wong, Ruth Ozeki, Evelyn Lau, Denise Chong, and Madeleine Thien. In addition, exciting voices in Canadian literature are represented by Kim Fu, Doretta Lau, Corinna Chong, Terry Watada, Derwin Mak, Eric Choi, and C.E. Gatchalian. Established and emerging poets such as Fred Wah, Evelyn Lau, Rita Wong, Souvankham Thammavongsa, and Michael Prior also grace the anthology with their work. Finally, three award-winning authors have given permission for excerpts of their works-in-progress to be included: Joy Kogawa (Gently to Nagasaki, a new memoir about Japanese atrocities during World War II), Yasuko Thanh ("Lucky in Saigon," a novel soon to be published as Mysterious Fragrance of the Yellow Mountains), and SKY Lee (Progress in Process).